Hindu religion and to pilgrimages made to sacred shrines are here given. ‘The belief of educated and uneducated people differs in every nation; for the former strive to conceive abstract ideas and to define general principles, while the latter do not pass beyond the apprehension of the senses and are content with derived rules, without caring for details, especially in questions of religion and law, regarding which opinions and interests are divided. With regard to God, the Hindus believe that he is one, eternal, without beginning and end, acting by free will, almighty, all-wise, living, giving life, ruling, and preserving; one who is unique in his sovereignty, beyond all likeness and unlikeness, and neither resembling anything nor having anything resemble him. In order to illustrate this, we shall produce some extracts from the _Hindu literature, lest the reader should think that our account is nothing but hearsay. that the existing beings are not and that he is, but it is impossible to think that he is not and that they are. qualities of bodies do not apply to him. Now some uneducated man reads this and imagines that God is as small as a point, and he does not find out what the word “point” in this sentence was really intended to express. He will not even stop with this offensive comparison, but will describe God as much larger, and will say, “He is twelve fingers long and ten fingers broad.” Further, if an uneducated man hears what we have mentioned, that God comprehends the universe so that nothing is concealed from him, he will at once imagine that this comprehending is effected by means of eyesight; that eyesight is only possible by means of an eye, and that two eyes are better than only one; and in consequence he will describe God as having a thousand eyes, meaning to describe his omniscience. of existence; and as their number is, though not unlimited, still an enormous one, the soul requires an enormous space of time in order to finish the contemplation of such a multiplicity of objects. The soul acquires knowledge only by the contemplation of the individuals and the species, and of their peculiar actions and conditions. It gains experience from each object, and thereby gathers new knowledge. 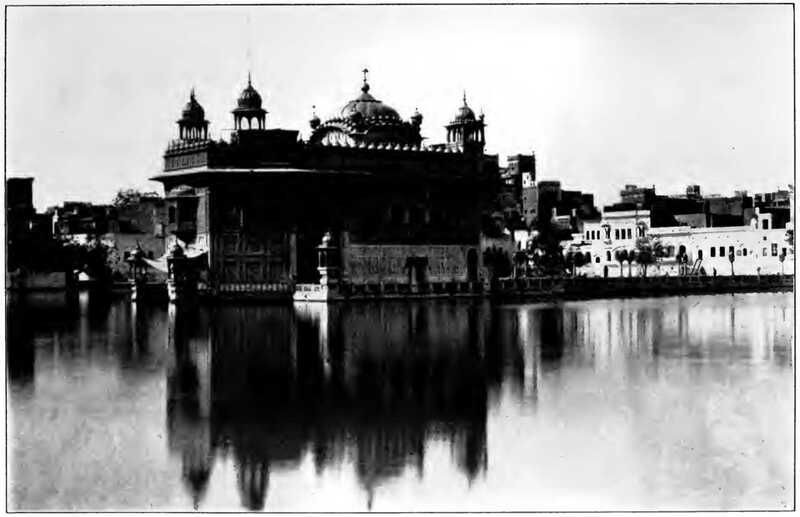 The Golden Temple and Lake Amritsar. as they prove to be good. or bad. The object of the migration through the world of reward (i.e. heaven) is to direct the attention of the soul to the good, that it may become desirous of acquiring as much of it as possible. The object of its migration through the world of punishment (i.e. hell) is to direct its attention to the bad and abominable, that it may strive to keep as far as possible aloof from it. The migration begins from low stages and rises to higher and better ones, not the contrary, as we state on purpose, since the one is a priori as possible as the other. The difference of these lower and higher stages depends upon the difference of the actions, and this again results from the quantitative and qualitative diversity of the temperaments and the various degrees of combinations in which they appear. is dissolved. Separation and dissolution take place, and the soul returns to its home, carrying with itself as much of the bliss of knowledge as sesame develops grains and blossoms, never afterwards separating from its oil. The intelligent being, intelligence and its object, are united and become one. It is now our duty to produce from Hindu literature some clear testimonies as to this subject, together with cognate theories of other nations. The Hindus call the world loka. Its primary division consists of the upper, the low, and the middle. 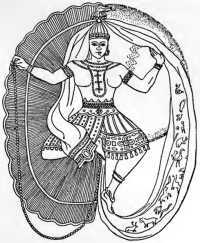 The upper one is called svargaloka, i. e. paradise; the low, nagaloka, i. e. the world of serpents, which is hell, and which is also called naralOka, and sometimes also patala, i. e. the lowest world. 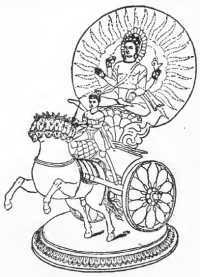 The middle world, the one in which we live, is called madhyaldka and manushyaloka, i. e. the world of men. In the latter, man has to earn his reward which he receives in the upper, whilst in the low he receives punishment. A man who deserves to come to svargaloka or nagaloka there receives the full recompense of his deeds during a certain length of time corresponding to the duration of his deeds, but in either of these worlds there is only the soul, the soul free from the body. For those who do not deserve to rise to heaven or to sink as low as hell, there is another world called tiryagloka, the irrational world of plants and animals, through the individuals of which the soul has to wander in metempsychosis until it reaches the human being, rising by degrees from the lowest kinds of the vegetable world to the highest classes of the sensitive world. The stay of the soul in this world has one of the following causes: either the award which is due to the soul is not sufficient to raise it into heaven or to sink it into hell, or the soul is in its wanderings on the way back from hell; for they believe that a soul returning to the human world from heaven at once adopts a human body, whilst that one which returns there from hell has first to wander about in plants and animals before it reaches the degree of living in a human body. We have given this enumeration only in order to show what kinds of deeds the Hindus abhor as sins. Some Hindus believe that the middle world, the one for earning rewards, is the human world, and that a man wanders about in it because he has received a reward which does not lead him into heaven, but at the same time saves him from hell. They consider heaven as a higher stage, where a man lives in a state of bliss which must be of a certain duration on account of the good. deeds he has done. On the contrary, they consider the wandering about in plants and animals as a lower stage, where a man dwells for punishment for a certain length of time, which is thought to correspond to the wretched deeds he has done. People who hold this view do not know of any hell but this kind of degradation below the degree of living as a human being. which a man had in doing it; and a man will receive his reward either in the form in which he now lives on earth, or in that form into which his soul will migrate, or in a kind of intermediary state after he has left his present shape and has not yet entered a new one. 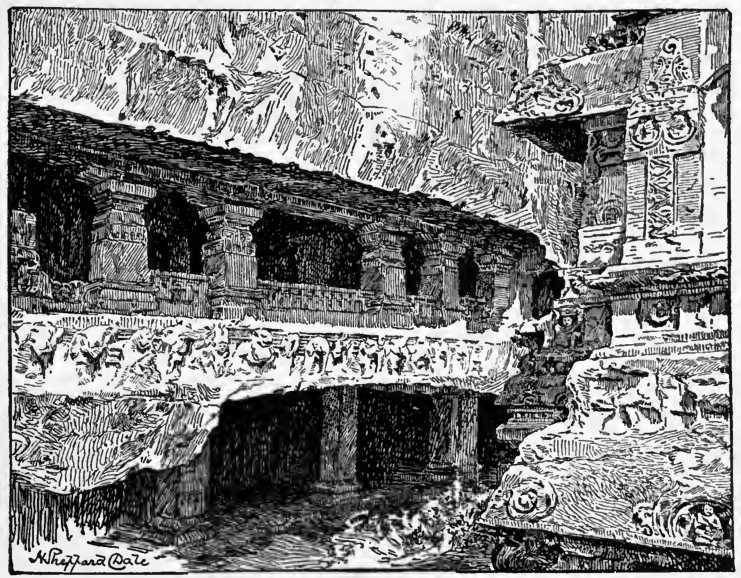 Here, now, the Hindus quit the path of philosophical speculation and turn aside to traditional fables as regards the two places where reward or punishment is given, saying, for instance, that man exists as an incorporeal being in the world beyond the present, and that, after having received the reward of his actions, he again returns to a bodily appearance and human shape in order to be prepared for his further destiny. Some, therefore, do not consider the reward of paradise a special gain, because it has an end and is not eternal, and because this kind of life resembles the life of this our world; for it is not free from ambition apd envy, having in itself various degrees and classes of existence, whilst cupidity and desire do not cease save where there is perfect equality. We have already said that, according to the belief of the Hindus, the soul exists in these two places without a body. But this is only the view of the educated among them, who understand by the soul an independent being. However, the lower classes, and those who cannot imagine the existence of the soul without a body, hold very different views concerning this subject. One is this, that the cause of the agony of death is the soul’s waiting for a shape which is to be prepared. It does not quit the body before a cognate being of similar functions has originated, one of those which nature prepares either as an embryo in a mother’s womb or as a seed in the bosom of the earth. Then the soul quits the body in which it has been staying. Others hold the more traditional view that the soul does not wait for such a thing, but that it quits its shape on account of its weakness while another body has been prepared for it out of the elements. 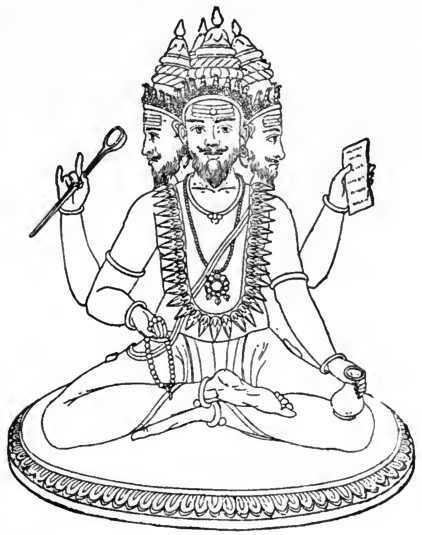 This body is called ativahika, “that which grows in haste,” because it does not come into existence by being born. The soul stays in this body a complete year in the greatest agony, no matter whether it has deserved to be rewarded or to be punished. For this reason the heir of the deceased must, according to Hindu usage, fulfil the rites of the year for the deceased, duties which end with the end of the year, for then the soul goes to that place which is prepared for it. 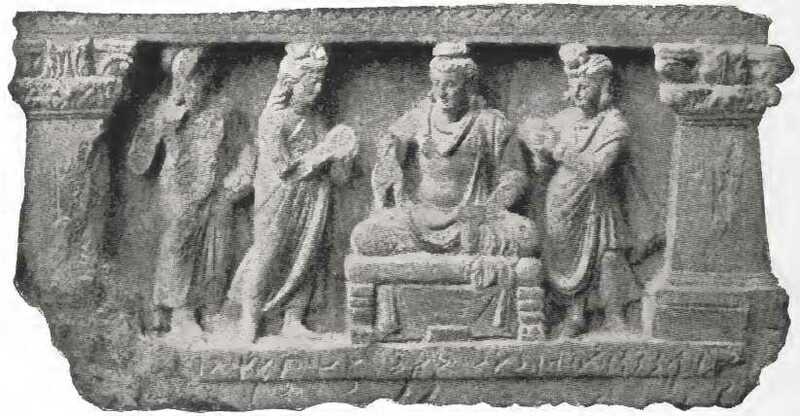 An inscribed Buddhist sculpture from Hashtnagar, dated 384 A.D.
and small ones, as if they were present in the holy places. the Deluge. Some people even pretend to know that all mankind were one large idolatrous body before God sent them his prophets. Among the famous idols of Hindustan was that of Multan, dedicated to the sun, and therefore called Aditya. It was of wood covered with red Cordovan leather and in its two eyes were two red rubies. It is said to have been made over two hundred thousand years ago. When Mohammad ibn Kasim ibn al-Munabbi conquered Multan, he inquired how the town had become so very flourishing and how so many treasures had there been accumulated, and then he found out that this idol was the cause, for pilgrims came from all sides to visit it. Therefore he thought it best to have the idol where it was, but he hung a piece of cow’s flesh on its neck by way of mockery. On the same place a mosque was built. 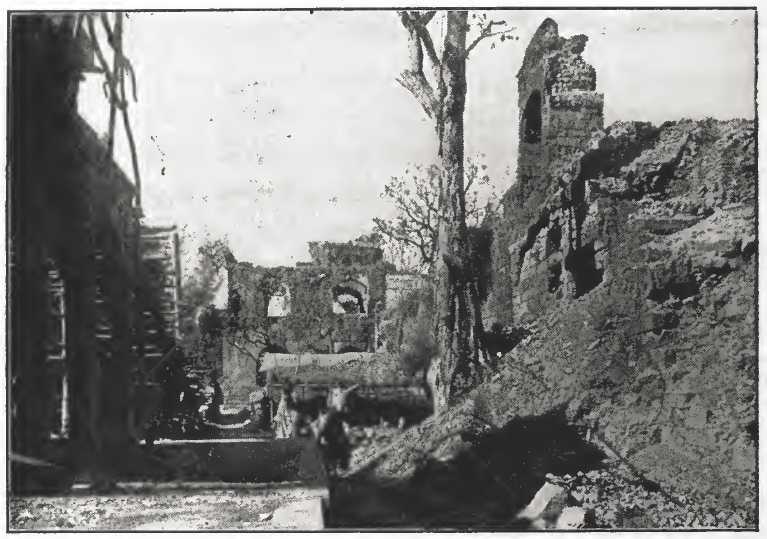 When the Karmathians occupied Multan, Jalam ibn Shaiban, the usurper, broke the idol into pieces and killed its priests. The city of Thanes-war is highly venerated by the Hindus. The idol of that place is called Cakrasva-min, “the owner of the discus.” It is of bronze and is nearly the size of a man. It is now lying in the hippodrome in Ghazni, together with another idol of vile form. 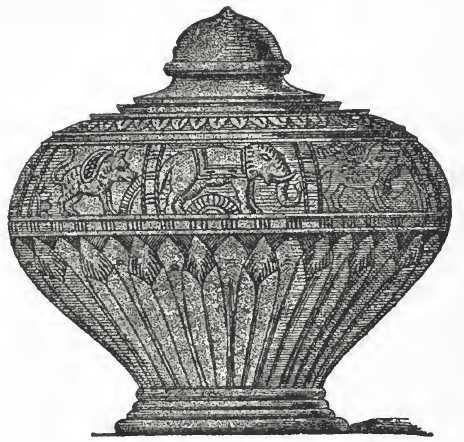 This Cakrasvamin is said to have been made in the time of Bharata as a memorial of wars connected with his name. In Inner Kashmir, about two or three days’ journey from the capital toward the mountains of Bolor, there is a wooden idol called Sarada, which is much venerated and frequented by pilgrims. if it were drawing water; in the left hands give him a shield, a bow, a discus, and a conch. If you give him four hands, omit the bow and the arrow, the sword and the shield. If you give him two hands, let the right hand be drawing water, the left holding a conch. If the figure is to represent Baladeva, the brother of Narayana, put earrings into his ears and give him the eyes of a drunken man. “If you make both figures, Narayana and Baladeva, join with them their sister Bhagavati, the wife of Siva, her left hand resting on her hip a little way from her side, and her right hand holding a lotus. If you make her four-handed, place in the right hands a rosary and a hand drawing water; in the left hands, a book and a lotus. If you make her eight-handed, place in the left hands a pot, a lotus, a bow, and a book; in the right hands, a rosary, a mirror, an arrow, and a water-drawing hand. If the figure is to represent Samba, the son of Vishnu, put only a club in his right hand. 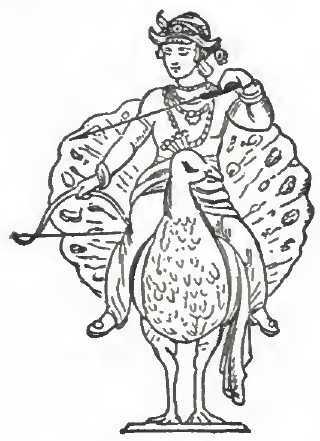 If it is to represent Pradyumna, the son of Vishnu, place in his right hand an arrow, in his left hand a bow. And if you make their two wives, place in their right hands a sword, in the left a buckler. weapon called vajra. It has a handle similar to the sakti, but on each side it has two swords which join at the handle. On his front place a third eye, and make him ride on a white elephant with four tusks. 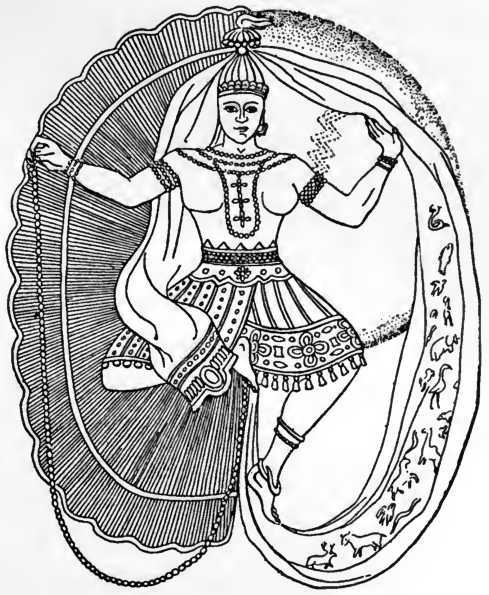 Likewise, make on the front of the idol of Mahadeva a third eye right above, on his head a crescent, in his hand a sword and a weapon called sala, similar to the club but with three branches; and let his left hand hold his wife Gauri, the daughter of Him- avant (the Himalayas), whom he presses to his bosom from the side. 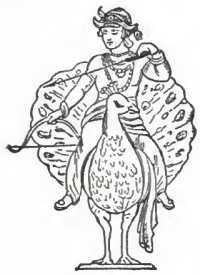 limbs, rings in the ears, the neck adorned with pearls which hang down over the breast, a crown of several compartments, two lotuses in the hands, and the dress of the Northerners which reaches down to the ankle. The Zoroastrians are forbidden by their religion to burn or bury their dead, or to consign them to the rivers, lest the sacred elements, fire, earth, and water, should in any way be defiled. Their sacred books enjoin upon them to expose corpses upon dokhmah.” or Tower of Silence, to be devoured by the fowls of the air. The bones denuded of the ‘flesh’liA crumble into dust beneath the parching tropical sun. At Bombay the vulture-haunted towers stand in a beautiful garden of waving palms on Malabar Hill. overlooking the city. section is inserted here on account of its direct connection with what has gone before in this and in the preceding chapter. 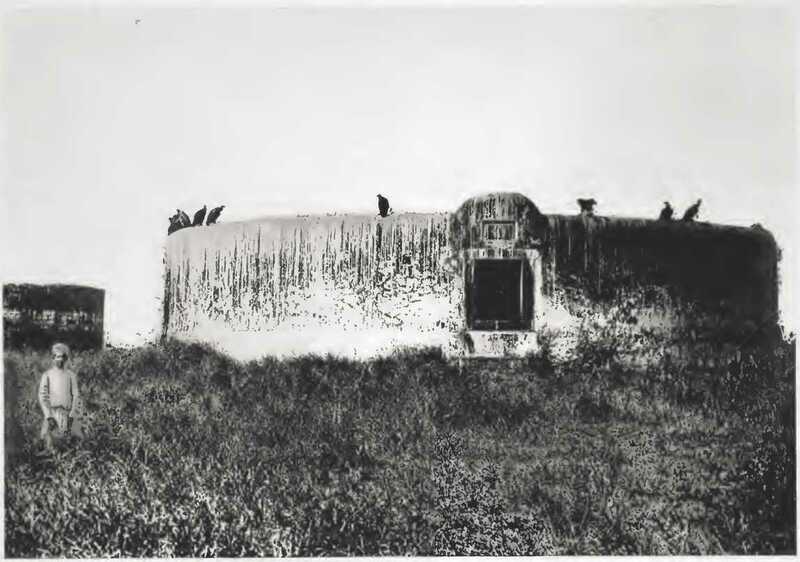 ‘In the most ancient times in India the bodies of the dead were exposed to the air by being thrown on the fields without any covering; sick people also were exposed on the fields and in the mountains, and were left there. If they died there, they had the fate just mentioned; but if they recovered, they returned to their dwellings. Thereupon there appeared a legislator who ordered people to expose their dead to the wind. 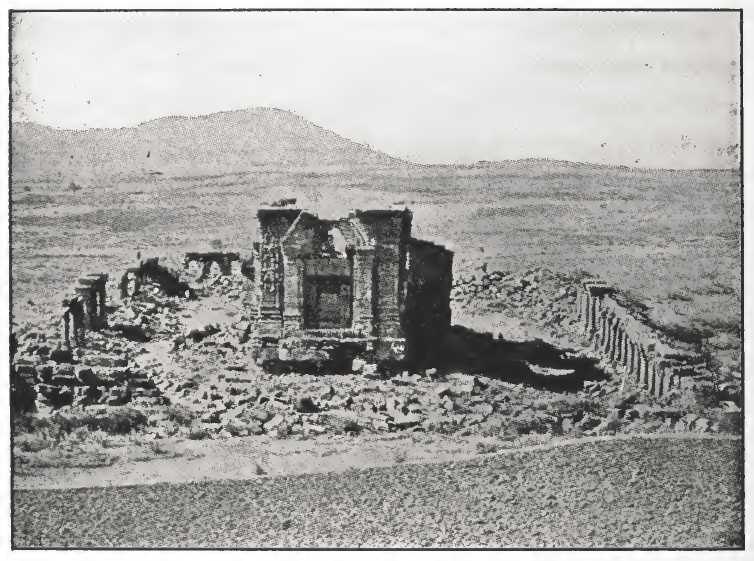 In consequence, they constructed roofed buildings with walls of rails, through which the wind blew, passing over the dead, something like the grave towers of the Zoroastrians. 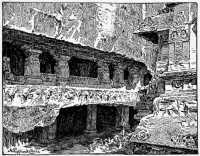 After the Hindus had practised this custom for a long time, Narayana bade them hand the dead over to the fire, and ever since they have been in the habit of burning them, so that nothing remains of them, and every defilement, dirt, and smell is annihilated at once, so as to leave scarcely a trace behind. and earthly part of them by fire, and afterwards to attract to himself the immortal part of them, and to raise their souls to heaven.” In these words there is a reference to burning as a Greek custom, but it seems to have been in use only for the great men among them. The Hindus express themselves in a similar way. There is a point in man by which he is what he is. This point becomes free when the mixed elements of the body are dissolved and scattered by combustion. conjunction and opposition (new moon and full moon), in the seasons of winter and spring.” A similar view is recognized in the following words of Mani: “Other religious bodies blame us because we worship the sun and moon, and represent them as an image. But they do not know their real nature; they do not know that the sun and moon are our path, and the door whence we march forth into the world of our existence into heaven, as has been declared by Jesus.” So he maintains. People relate that Buddha ordered the bodies of the dead to be thrown into flowing water. Therefore his followers, the Shamanians, throw their dead into the rivers. into some brook of running water. 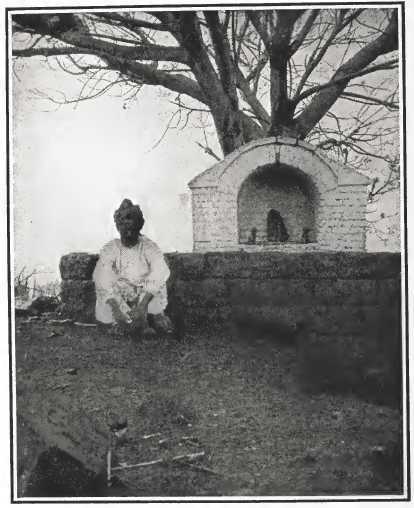 On the spot where the body has been burned, they raise a monument similar to a mile-stone, plastered with gypsum. The bodies of children under three years are not burned. Those who fulfil these duties toward the dead afterwards wash both themselves and their clothing for two days, because they have become unclean by touching the dead. Those who cannot afford to burn their dead throw them either somewhere on the open field or into running water. 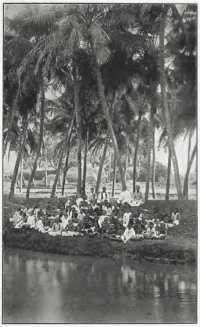 Now as regards the right of the body of the living, the Hindus would not think of burning it save in the case of a widow who chooses to follow her husband, or in the case of those who are tired of life, and are distressed over some incurable disease of body, some irremovable bodily defect, or old age and infirmity. This, however, no man of distinction does, but only Vaisyas and Sudras, especially at those times which are prized as the most suitable for a man to acquire in them, for a future repetition of life, a better form and condition than that in which he happens to have been born and to live. Burning oneself is forbidden to Brahmans and to Kshatriyas by a special law. Such being the case, if they wish to dispose of themselves by committing suicide, they do so at the time of an eclipse in some other manner, or they hire somebody to drown them in the Ganges, keeping them under water till they are dead. 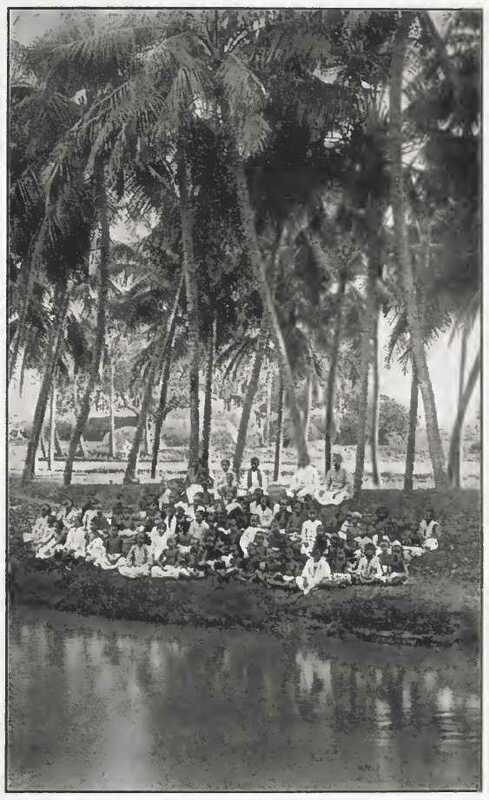 There is space for a single other citation from al-Biruni in connection with the religion of the Hindus; it is taken from his sixty-sixth chapter, in which he treats of Hindu pilgrimages and of the visits which they pay to certain sacred places as a part of their religious duty. the mountain Aruna, always covered with snow, which cannot be ascended. At its foot is the pond Sailoda, whence comes the river Sailoda. North of Kailasa is the mountain Gaura with the pond of golden sand at its foot. their ablutions. In this they have attained a very high degree of art, so that Mohammedans, when they see them, wonder at them, and are unable to describe them, much less to construct anything like them. 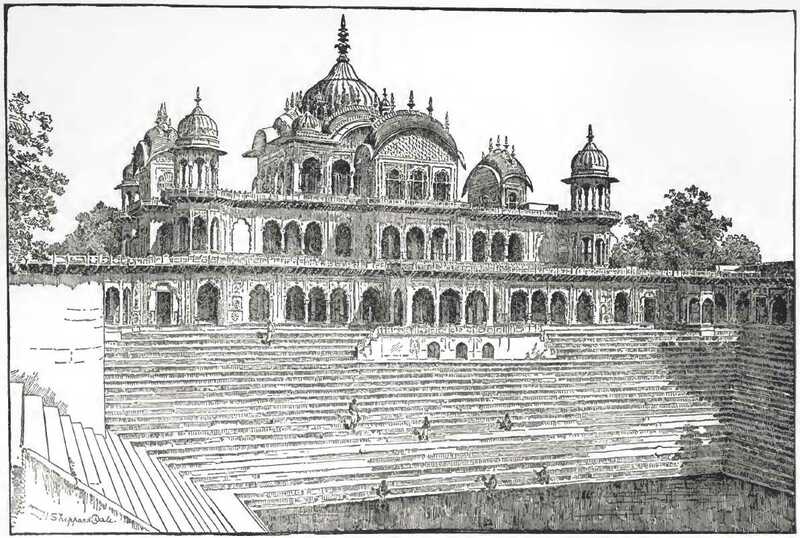 They build them of great stones of an enormous bulk, joined to each other by sharp and strong cramp-irons, in the form of steps or terraces, like so many ledges; and these terraces run all around the pond, reaching to a height of more than a man’s stature. On the surface of the stones between two terraces they construct staircases rising like pinnacles. Thus the first steps or terraces are like roads leading round the pond, and the pinnacles are steps leading up and down. If ever so many people descend to the pond whilst others ascend, they do not meet each other, and the road is never blocked up, because there are so many terraces, and the ascending person can always turn aside to another terrace than that on which the descending people go. By this arrangement all troublesome thronging is avoided. 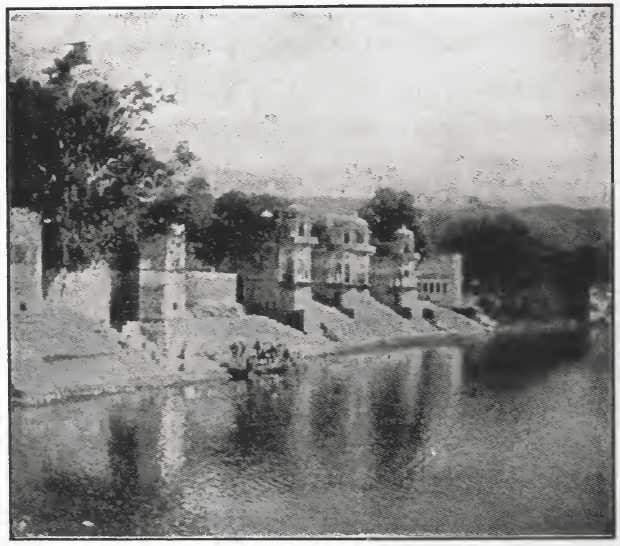 The ponds become particularly famous for holiness either because some important event has happened at them, or because there is some passage in the holy text or tradition which refers to them; and the Hindus have some places which are venerated for reasons connected with their law and religion, such as Baranasi (Benares), for their anchorites wander to it and stay there for ever, as the dwellers of the Ka`ba stay for ever in Mecca. They want to live there to the end of their lives, that their reward after death may be the better for it. They say that a murderer is always held responsible for his crime and punished with a punishment due to his guilt, except in case he enters the city of Benares, where he obtains pardon. 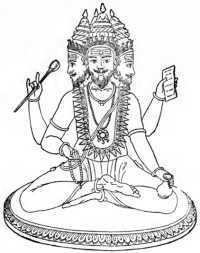 Regarding the cause of the holiness of this asylum they relate the following story: “Brahma was four-headed in shape. 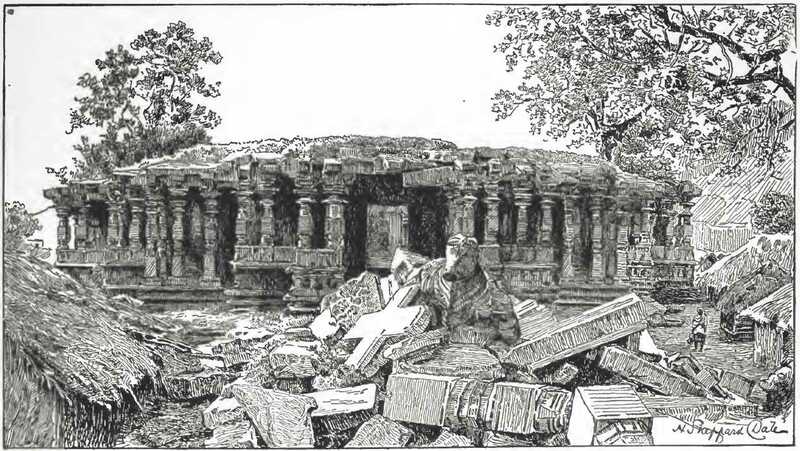 Now some quarrel happened between him and Sankara (Siva), and the fight which ensued had the result that one of the heads of Brahma was torn off. At that time it was the custom for the victor to take the head of the slain adversary in his hand and let it hang down from his hand as an act of ignominy to the dead and as a sign of his own bravery. Thus the head of Brahma was dishonoured by the hand of Mahadeva, who always took it with him wherever he went and whatever he did. 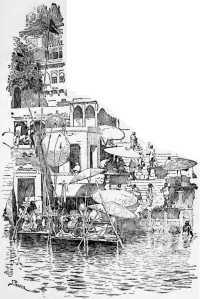 He never once separated himself from it when he entered the towns, till at last he came to Benares.